A jury is directed to only pronounce a guilty verdict if they are sure "beyond a reasonable doubt". In this day and age of Stepford mentality, we are pressured to conform to current PC beliefs and behaviors, and people are (unfortunately) reluctant to assert themselves. However the true function of a jury depends not upon going along with the crowd, but with standing your ground and remaining true to your beliefs, regardless of the pressures exerted on you by others. When you vote "guilty", can you truly say that none of the evidence could support another theory? Can you truly say that you held true to your own doubts and beliefs that another explanation held weight and was reasonable? Can you truly say that you stood up against pressure to vote with the crowd? Pressure to end the case before the weekend? Pressure from the prosecutor or court to not leave a "hung jury"? And if you had been a juror in the Jon Massey case, what would it have taken to elevate the level of doubt in your mind? Would hearing from two of the "adult" men that Ruby had been trying to figure out ways to get out from under supervision for MONTHS prior to allegations have helped? Would hearing from her mother that what incited Ruby into a violent attack against her mother, sister, and Jon Massey was a threat to arrest her 21 year old boyfriend - less than two weeks before the false allegations? Oh, wait, the judge screamed at the mother in front of you and then ordered you cleared from the room and didn't allow you to hear that piece of evidence. And the judge and prosecutor prevented you from hearing the same story from Ruby's sister. Would hearing it have given you enough doubt? What if you had known that Ruby had made allegations against multiple people over the years, including her "best friend", and the sons of some well-known local individuals? Would that have made the difference? I feel sorry for the jurors in the Jon Massey case. Based on what they DIDN'T know, they found an innocent man guilty. I truly feel sorry for them. Well, most of them. 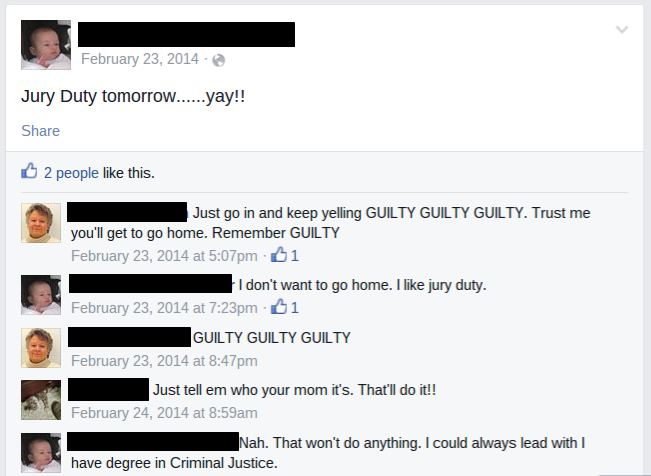 There has to be a special place for this juror who made the following post on Facebook the day before being chosen for jury duty - most of the conversation is between the juror and her mother. Almost sounds like a ringer or a plant. I would hope that when being called to jury duty, this serves as a cautionary tale - the judge and the DA rely on being elected. To get re-elected they need to present an image of being able to convict "bad guys", whether the charges and allegations are true. The more heinous the offense, the more favorable the election publicity. Don't be a sheeple - think for yourself, believe for yourself, and remember that guilt must be beyond a reasonable doubt!